A spigot mortar emplacement from World War Two. On river bank just southeast of pub. World War Two spigot mortar base or machine gun post. Usual pillar with metal spigot. E. Rose, (NAU) 29 August 1984. 2001. 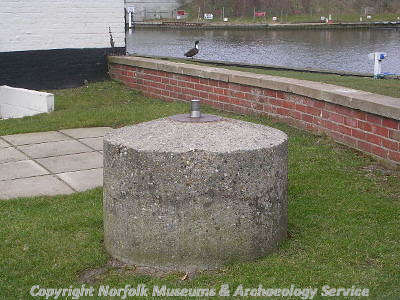 The World War Two remains around Acle constitute a system of national importance. --- Photograph: Kent, P.. 1994. KHG 10.